Pittsburgh (CNN) - President Barack Obama praised U.S. forces on Tuesday for capturing Ahmed Abu Khatallah, a militia leader alleged to have been a mastermind of the deadly 2012 attack on the American diplomatic compound in Benghazi, Libya. "We are all aware of the tragedy that happened in Benghazi where four Americans, including our ambassador there, Chris Stevens, was killed in an attack on a consulate office there," Obama said in Pittsburgh. "I said at the time that my absolute commitment was to make sure that we brought to justice those who have been responsible," he added. He said Abu Khattalah is currently being transported to the United States to face charges. He faces indictment in federal court. His arrest, Obama said, sends a "message to the world, that when Americans are attacked, no matter how long it takes, we will find those responsible and we will bring them to justice. Regardless how long it takes, we will find you. I want to make sure everyone around the world hears that message very clearly. My first solemn duty as President and as commander in chief is to keep the American people safe." "There are a lot of danger, out there and a lot of challenges. Our diplomats serve with incredible courage and valor in some very difficult situations. They need to know that this country has their back and will always go after anybody who goes after us," he said. Obama made the remarks at the beginning of an event that highlighted a new plan to align cities, states and the federal government to help entrepreneurs and inventors get their innovations into the marketplace. He visited TechShop, a chain of member-based workshops, to announce the plan, which the White House said involves mayors and local leaders from 90 cities and towns across the country who have pledged to provide physical locations to spur local inventions. "If you want to put in some sweat equity you can make it here in America and live out your American dream." the President said. The TechShop facility visited by Obama is equipped with new generations of 3D printers and prototyping machines that individuals can rent and use on site. It also has equipment, like laser cutters, tools and design software, that inventors can rent and use on a shared basis. It also offers classes to aspiring inventors. Obama noted that the smartphone mobile payment accessory "Square" was prototyped and designed at the San Francisco TechShop. He also pulled out his personal Apple iPad, which has a cover that was also designed by an inventor using TechShop equipment. 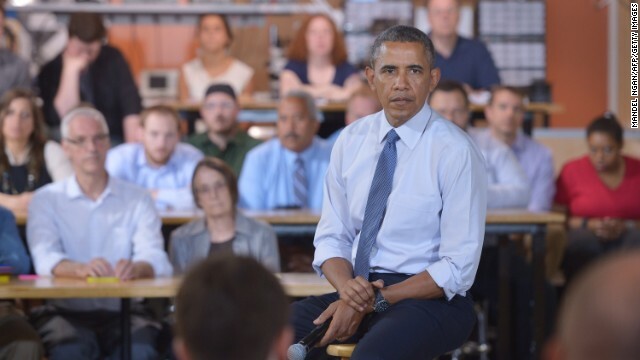 According to press pool reports, Obama toured a prototyping area with a table-top, open-air 3-D printer. He tried out an injector mold and created a plastic presidential seal cast in an aluminum mold. Obama told the group of about 80 inventors and entrepreneurs that the federal government is looking at ways to lend excess space and capacity at federal laboratories and facilities to help individuals prototype and model new products. For example, Obama said, inventors might be able to get access to wind tunnels at NASA during off peak testing hours. He smiled and looked at the crowd and joked, "Now, I can't rent out the space shuttle to you," And, joked, "I don't want you messing around" with particle colliders. "I want physicists in there doing the work." "You're losing it Rudy. They know exactly what kind of weapons he was carrying because they have it all on video from the cameras on site. Please try to keep up." Uh... he wasn't "captured Sunday" at Benghazi you moron... try and keep up yourself. You are too busy trying to get your right wing talking points down, you don't even read the posts you are criticizing. You are never any fun to even respond to on here because you lack intelligent thought in any capacity. Another Very politically motivated planned move at the expense of of the families of our 4 dead americans that are still begging for answers but being stonewalled as they continue to grieve over the graves not knowing the truth and not expecting it for that matter they said it and we know it . How much lower can a dem go ? If they can i dont want to kn0w . Politically motivated. How terrible to follow through on his promise. Terrible for his naysayers. Meanwhile, Republicans have reported no progress on their investigation of a Benghazi coverup. Their investigation is not about the attack itself or who was behind the attack. Republicans don't care about those things. They only care about the coverup, the one that they are still trying to find. Now, will the GOP do the right thing and cheer that the man responsible for the deaths of 4 Americans in Libya has been captured (the very event that has tortured their very souls for months on end).... or will they cook up something else to assail the President with and ignore some good news. Maybe they'll want to support this terrorist's legal rights and due process. They must be waiting on their spin machine to comment. Thanks again. Reid nailed it beautifully: "They’re insulting these good men and women who did some courageous things, heroic things, in order to criticize President Obama. I think they’ve lost touch with reality; it’s really pathetic, there’s no other word for it." "They should stop and think, just for a little bit, about what it’s like to put your life on the line and to do something for our country – that’s what they did."